State College Spikes President Jason Dambach has departed the organization to pursue opportunities outside of Minor League Baseball. 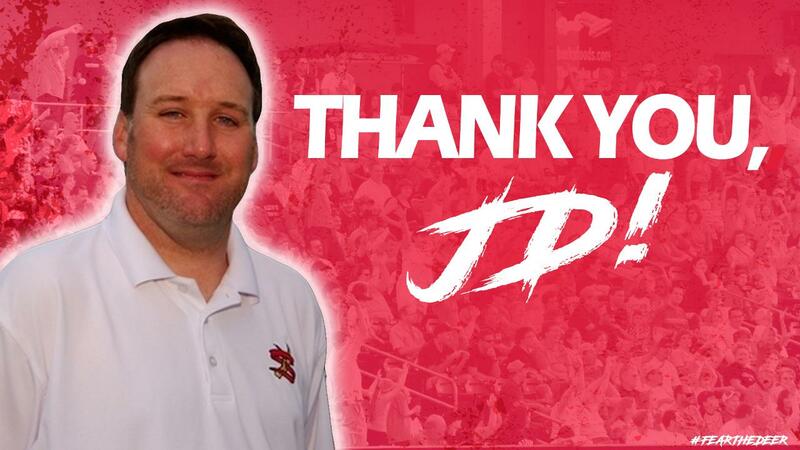 "I'd like to thank Chuck Greenberg for 16 wonderful years together in professional baseball in Altoona, State College and Frisco, and especially for providing me the opportunity to be associated with the Spikes going back to the inception of the franchise," said Dambach. "As State College residents, my family and I will forever remain the Spikes' biggest fans and community ambassadors." For nearly two decades, Dambach has been a key contributor to franchises across the Greenberg Sports Group. After playing a key role in the formation of the Spikes in 2006 while serving as Director of Communications for the Altoona Curve, he was named State College's second-ever General Manager in December 2008, overseeing the franchise's further growth as Central PA's premier destination for fun, affordable family entertainment in the summertime. During his time as Spikes General Manager, the team won both the New York-Penn League's 2011 Vincent McNamara Outstanding Club Award and the 2013 Baseball America Freitas Award as the top franchise at the Class-A Short-Season level. Individually, Dambach was named the winner of the NYPL's 2012 Robert Stedler Executive of the Year Award and the 2010 Robert Julian Community & Baseball Service Award for his long-time service to the baseball industry and commitment to the community. Following the 2014 season, he joined the Frisco RoughRiders as General Manager and Executive Vice President, while maintaining his connection with the Spikes as the franchise's President. "Regardless of the role he held or the team he worked with, Jason was integral in taking our franchises to new heights, and that was especially true in State College and Frisco," said Managing General Partner Chuck Greenberg. "I am immensely grateful for his contributions and wish him nothing but the best in his future endeavors." The Spikes executive leadership team continues to be led General Manager Scott Walker, who has led the club's day-to-day operations since 2015. Under Walker's leadership, the Spikes have continued to explore new and exciting strategies to ensure that fans enjoy each and every night at Medlar Field at Lubrano Park. The team will continue to build on its reputation for great service, creative promotions and the most affordable family fun in Central PA. The Spikes' 2019 home schedule begins on Saturday, June 15, when they take on the Williamsport Crosscutters (Philadelphia Phillies). 2019 Season Seat Memberships, Flex Books and group outings for all 38 home games through September 1 are currently available by calling (814) 272-1711.